BDS Suspension takes the 2014-2018 Chevy/GMC 1500 trucks to new heights with the addition of 8" lift systems joining the current 2", 4", and 6" lift options allowing for additional clearance. These new suspension systems utilize the tried and true high-clearance IFS design that has made BDS the preferred suspension lift for late model GMs updated to correct suspension, steering and driveline geometry for improved on road comfort and off-road performance. As with all BDS kits these new 8" options are backed by Factory Protection Plus offering you peace of mind for your adventure. This includes a BDS No Fine Print Warranty, FMVSS No.126 compliance testing and a 5year-100,000mile drivetrain warranty. Build your Chevy/GMC up right with BDS Suspension. *Additional wheel/tire sizes can be used, however may require additional trimming. 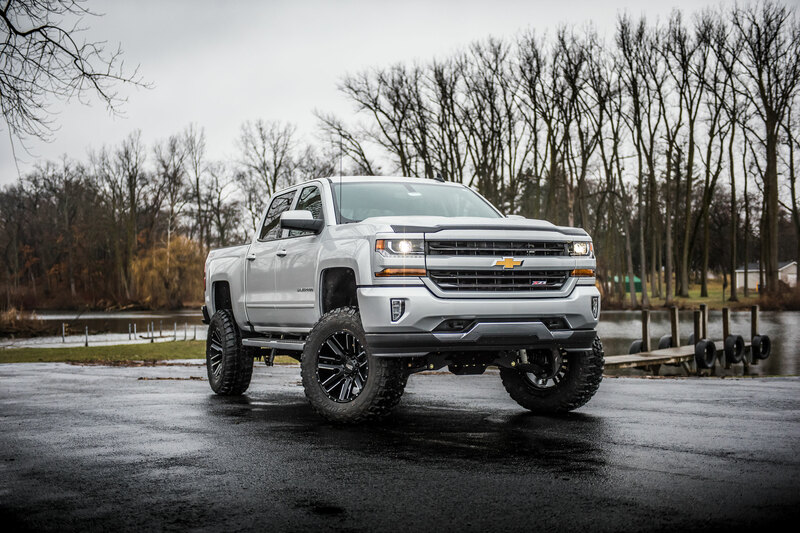 Coldwater, MI: BDS Suspension is now taking the 2014-2018 Chevy/GMC 1500 trucks to new heights with the addition of 8” lift systems joining the current 2”, 4”, and 6” lineup of BDS options. These new suspension systems offer even more tire clearance and are designed to improved your truck's offroad capability. 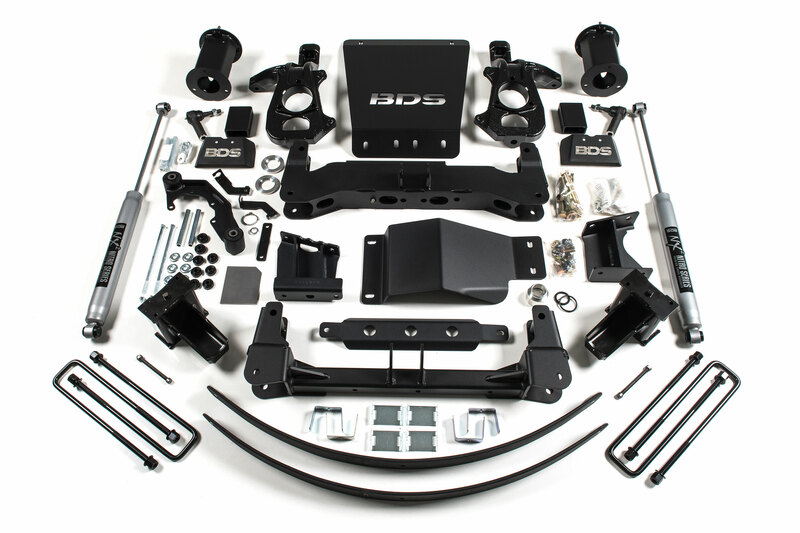 At the heart of these new systems BDS utilizes the tried and true high-clearance IFS design that has made BDS the preferred suspension lift for late model GMs. This consists of a pair of newly designed 1/4" thick laser cut high clearance crossmembers and differential skid plate to reposition the lower arms while adding underbody protection and strength. These combined with the specially designed ductile iron replacement steering knuckles allow this system to maintain proper geometry for ESC system compatibility. Up front the kits use a multipoint differential relocation kit and to securely reposition the front differential to correct CV axle operating angle and allow use of the stock front driveshaft with the supplied boot spacer. Along with retaining the factory geometry, factory ride quality is maintained at the new height using a set of BDS branded top mounted strut spacers allowing for quick and easy installation. Rounding out the front of this kit are heavy duty steering tie rod ends to work with the new knuckle assemblies, longer sway bar links and sway bar drop brackets to correct operating angle, brake line brackets and a BDS front skid plate. In the rear of this 8” lift system, the factory block is replaced with a 6” fabricated block, add-a-leaf and longer u-bolts to lift and level the stance. These blocks are ultra strong, specially designed with an offset pin to recenter the axle along with an integrated bump stop wing to properly limit suspension compression. Also included, BDS supplies brake line brackets allow the use of factory brake lines and a pair of specially tuned NX2 nitro series shocks are supplied to round out the rear of the kits. These kits come finished in a durable textured black powdercoat, all hardware is provided along with step-by-step installation instructions. 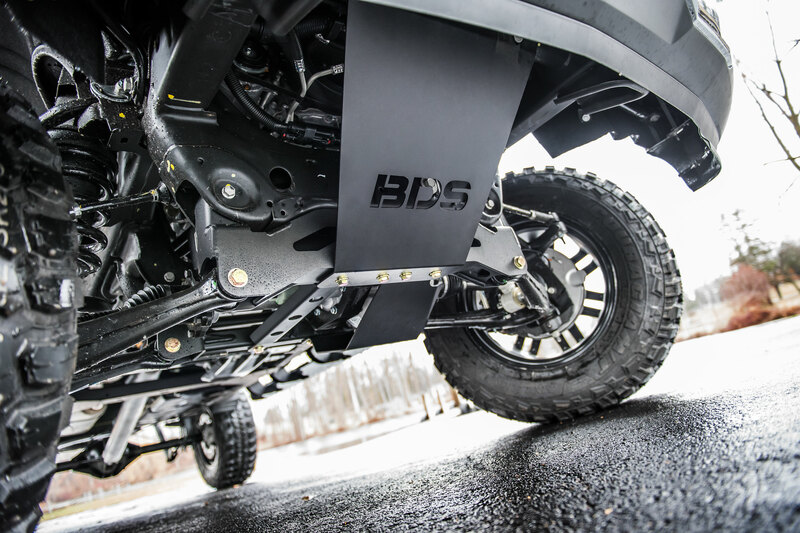 All BDS kits include Factory Protection Plus for the ultimate extended warranty to include BDS’s No Fine Print Warranty, FMVSS No.126 (ESC System) compliance certification and a 5year-100mile drivetrain warranty to match the dealer. Improve the look and capability of your late model Chevy/GMC 1500 truck with this new 8” lift system from BDS Suspension. You can install any size tire you want on there, that said a 40″ isn’t going to fit with 8″ of lift unless you make extensive fender/bumper modification. Even 37″ tires are tight with an 8″ lift and may require some trimming to eliminate all rubbing. Any update to the availability of the Fox coilovers? I’m ready to pull the trigger on this kit but would like to get it with the C/O’s……. We’re expecting them in soon. Keep an eye out for upcoming releases. Hey John, great to hear the 6″ kit has been working well for you. Short answer to your question is there is no simple conversion between the 6″ kit you are currently using up to this 8″ lift. 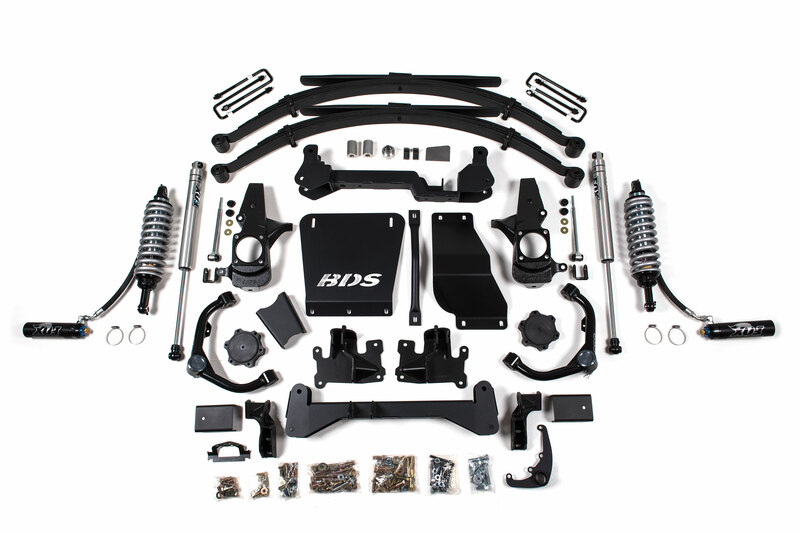 On your particular kit the base components (crossmembers, steering knuckles, diff drops, skids are shared between the 4″ and 6″ IFS kits and are designed to correct suspension-steering-driveline geometry at 4-6″ of lift. While there have been some customers stacking leveling kits or cranking up the coilovers on our 6″ kit to get more lift, its not recommended as it may cause drivability issues and lead to premature wear of front end components. Our 8″ lifts use different crossmembers, steering knuckles, diff drops, etc to correct geometry up at the 8″ lift height. If you’re for a bit more lift one idea to consider would be a small body lift as it wouldn’t effect suspension geometry. 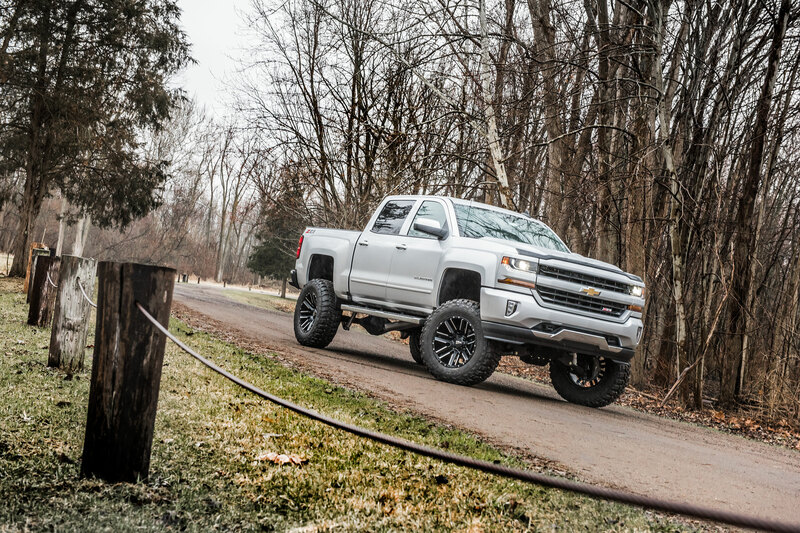 Zone Offroad offers a 1.5″ body lift that is compatible with our suspension lifts. I was wondering if BDS is considering doing a lifted strut option as they have in their other lifts? I see you do have coil overs but they tend to be pricey. Is there in the near future a plan to have the option of lifted struts instead of coil overs or strut spacers. Hey Scott, in general I’ll say there are several additional options/accessories in the works for these and other later model trucks. That said we have a company policy about not discussing new product development topics until parts are on the shelf ready to ship. The key benefits to the strut spacer are cost, ease of install and retaining factory ride quality. While the FOX 2.5 RR coilovers are are a more expensive option, they offer significantly improved performance on and offroad. Would be nice if there was an installation video to go with the paper installation instructions. Anything. especially with the drive shaft.